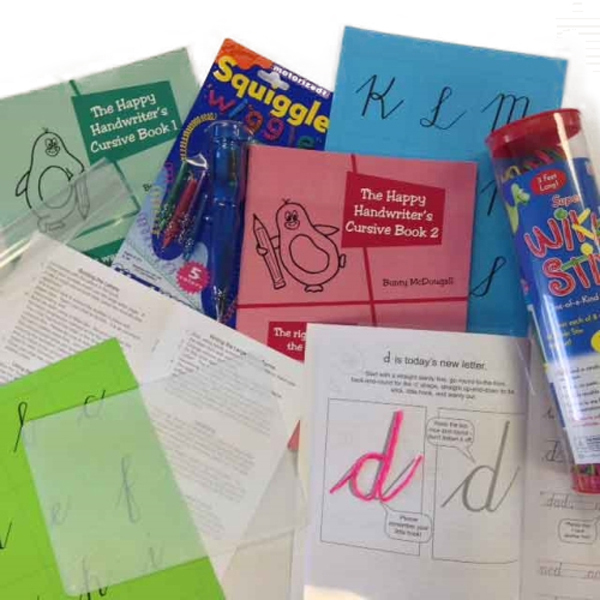 The Cursive Handwriting Bundle includes everything you will need to assist your child with the mastery of cursive handwriting. 2 sets ready to cut printed cursive memory game sheets. The memory games are your first step when embarking upon your cursive handwriting journey. They provide the opportunity to establish an automatic visual memory of the letter forms, which is critical to the establishment of efficient cursive handwriting. Building the letters using the Super Wikki Stix is not only the delight of every child, but assists with the consolidation of the formation patterns of the letters. This is further enhanced by the additional tactile input gained by placing the Texture Overlay Board either under, or over the letter pages. The two Cursive Books, with the assistance of the cheeky penguin who is sure to point out areas requiring special attention, take your child step by step through lower case letter formations, link ups, upper case letters and consolidation of speed and quality of handwriting. The Squiggle Wiggle Writer, a vibrating pen that the children can’t keep their hands off, also provides additional sensory feedback, which assists with the establishment of the motor maps for cursive letter formation in the brain. The Happy Handwriter’s Cursive Guide is a booklet that takes you step by step through the process you need to follow to ensure you maximize the benefit of the package to your child. If you are serious about cursive for your child – I really believe in the benefits of cursive – The Happy Handwriter’s Cursive Handwriting Bundle is the one for you.